Within the first several pages, it becomes obvious that Guy Adams in going to have a little irreverent fun with the legend that is Sherlock Holmes. Whether it’s John Watson describing himself as “The Crime Doctor” (a wink to the 1988 movie, Without a Clue), his blending of H.G. Wells’ tale of Edward Pendrick’s visit to The Island of Doctor Moreau, or a nod to his own World House novels in the form of explorer and big game hunter Roger Carruthers, Adams has mashed together works by two literary greats of the 19th century and come out with a winner. 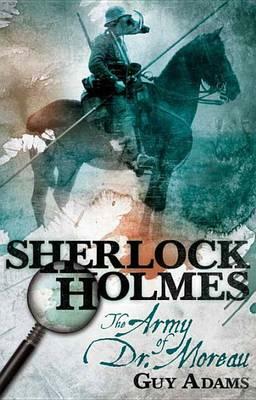 When citizens of London start turning up mauled by a variety of creatures that simply do not exist on her majesty’s island nation, Mycroft Holmes (he who is the government) turns to his brother Sherlock and offers him a chance to serve Queen and country and solve a seemingly impossible crime. Mycroft knows the story of Edward Pendrick and Dr. Moreau (once in his employ) and fears that Moreau is either not as dead as was formerly believed, or that someone has resurrected his work as a vivisectionist, hoping to create a race of super beasts for their own nefarious purposes. Sherlock finds himself intrigued, and before you know it, the game is afoot! The Army of Dr. Moreau is a rollicking good ride, as Holmes and Watson take to the cities sewers, tracing the path of a local gang leader whose description sounds suspiciously canine. They also meet with a group of Mycroft’s extraordinary gentlemen, from Professor George Edward Challenger (recently of Doyle’s The Lost World) to Professor Lindenbrook (of Verne’s A Journey to the Centre of the Earth) who have been tasked to assist in ways scientific and medical, and of course, Adams own creation, who will later become pivotal to the events of The World House and The World House: Restoration (two must read books if you decide you like Guy Adams). The novel does falter somewhat in the latter third, as Adams strays from the traditional Holmesian mystery to a straight up action novel, yet there is enough of Holmes’ and Watson essential nature to carry it to the finish. What starts out as a charming change of viewpoint (Holmes takes the reins as narrator when Watson becomes unavailable) becomes somewhat frenetic late in the novel, as every chapter is told from a different point of view. It does feel a bit rushed, and I wonder if his story could have benefitted from another fifty or so pages, perhaps expanding the role of Mycroft and his extraordinary gentlemen in the hunt for whomever has recreated Moreau’s madness in the slums of Victorian London. However, it doesn’t distract significantly from what is a thoroughly fun, although pulpy, pastiche.